Wednesday night was a bit of a jumble in our house at dinner time. My son had an end of the season pizza/pasta party with his wrestling team and my husband and middle daughter attended an end of the season dinner banquet for her basketball team. That left me and my youngest daughter dining at home. As she is not a big eater first thing in the morning, I wanted make her a breakfast I know she loves for dinner. This would give her time to enjoy every bite without being rushed. A big pile of Belgian waffles would surely fit the bill☺. Crispy on the outside, light and creamy on the inside with a hint of malt flavor--these waffles cover all necessary ground in both flavor and texture categories. And those deep-pockets are just asking to be filled with berries and whipped cream. There are actually two flavors that can be achieved with this recipe. This can be achieved by making the recipe two different ways. The first and the faster (waffles in 30 minutes) way is the one I described above. I find that I prefer this method. It uses yeast in the batter, but also uses baking powder for leavening. This process cuts down on time of preparation, but more importantly, it removes the yeasty/fermented flavor of which I am not fond. If you prefer a fermented flavor in your waffle, just omit the baking powder and allow the mixture to rise and refrigerate overnight. Any leftovers? Cool to room temperature, then place in a freezer bag. They freeze beautifully and reheat to crispy perfection in the toaster. Having said that, I usually make a double batch on weekends for quick weekday breakfasts. *Note- If you like a more yeasty/fermented flavor in your waffle, omit the baking powder and refrigerate the batter overnight. In a large bowl, whisk together all of the ingredients, leaving room for expansion. Cover with plastic wrap and let rest at room temperature for at least 30 minutes and up to one hour. The mixture will bubble and grow. Meanwhile, preheat the waffle iron. Pour 1/2 to 3/4 cup of batter (or the amount recommended by the manufacturer) onto the wells or center of the waffle iron. Close the lid and bake for the recommended amount of time or until the waffle is golden brown, about 5-6 minutes. Serve immediately or keep warm in a 200° F oven. Serve with berries and whipped cream, maple syrup, or whatever else you like. Enjoy! Lukewarm milk is warmer than room temperature, but not boiling hot. It is around body temperature, 98° F or 36° C.
This looks delicious! 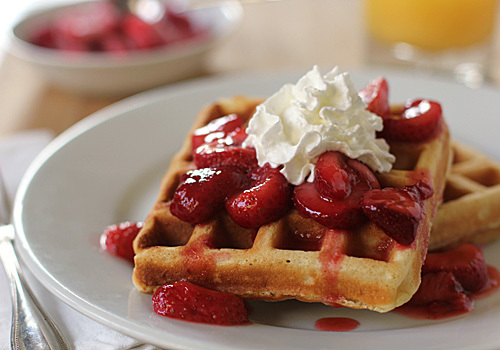 I miss having waffles, I'm going to make some this week! These were delicious. I have marked the recipe a keeper! Thanks. Pleased you enjoyed them and thank you for letting me know! I only use a waffle iron.